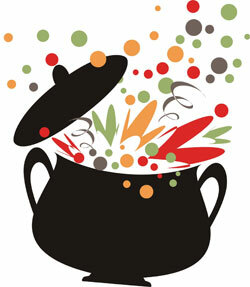 Boil and Bubble, Toil and Trouble by Jesse A. Stoff, M.D., M.D.H., F.A.A.F.P. When my daughter, Summer, gets a small cut on her finger and applies a Band-Aid, she does so with the full expectation that when the Band-Aid is removed a couple of days later, the cut will have been “magically” healed. She is usually rewarded by her faith in her immune system’s healing capacity. On a macroscopic level, healing appears to us as a miracle or as magic because of all the little elements that go into the repair of the damaged tissue. The removal of foreign material and destruction of harmful bacteria all happens in a microscopic world that is not directly accessible to our unaided eye. On a microscopic level, local cellular injury by the splinter calls in the troops of the immune system to attack the intruder and through a process of inflammation, sanitize it, push it out of the body and start the process of repair. Once the threat is eliminated the immune response stands down but maintains a constant vigilance for the next threat … or, at least it’s supposed to. Sometimes, as a result of an infection by a virus, mycoplasma or similar critter or from exposure to a toxin, the immune system doesn’t stand down and instead gets stuck in a chronic cycle of inflammation. There are many blood tests that measure the inflammatory response, but one common test is the hs-CRP which is a good non-specific measurement of inflammation, but as it turns out is also a good risk factor for a heart attack or stroke. Chronic inflammation is a self perpetuating cycle of immune response that persists even when the trigger is removed. It takes a lot of nutrients and the right set of circumstances to break the cycle. Once set in motion, something as simple and common as allergies or elevated levels of stress will continue to feed it. The term stress was coined by Dr. Hans Selye more than 70 years ago. According to Selye, “dis-ease is an attack on any particular aspect of your body or mind that creates a distressed physiology.” Stress is an individual’s non-specific response to any stimulus, conscious or unconscious, physical or physiological. It is such an integral component of our existence that Selye has stated that, “Complete freedom from stress is death.” There are two categories of stress: eustress (characterized by happiness and enjoyment) and distress (characterized by anguish, tension and worry). During distress the adrenal glands secrete the steroid hormone cortisol to excess and without the normal cycling that usually occurs, which will then suppress immune function and its ability to correctly modulate itself thus perpetuating the cycle of stress. When you respond to something that you are allergic to, there is a release of histamine as a result of the interaction of the IgE antibodies with Mast cells. Histamine is a pro-inflammatory molecule and can easily perpetuate chronic inflammation. Once the inflammatory response is initiated all sorts of chronic diseases may follow. The medical journals are rich with articles, almost weekly, on the association of everything, from Astrocytoma cancer to Zygomycosis, with chronic inflammation. More common diseases such as diabetes and heart disease are leading the pack of illnesses where chronic inflammation perpetuates and exacerbates the condition. Inflammation destabilizes cholesterol deposits in the coronary arteries, leading to heart attacks and strokes. It chews up nerve cells in the brains of Alzheimer’s victims. It may even foster the proliferation of abnormal cells and facilitate their transformation into cancer. To physicians, the whole notion that chronic inflammation can contribute to so many diverse illnesses is intriguing because of the accessibility of this potentially common pathway. It also causes us to rethink the role that common things like allergies and stress have in severe and chronic diseases. All of a sudden, the use of meditation and vitamin C as part of a cancer treatment program doesn’t seem so much of a stretch. Fortunately, there are many things that you can do to reduce your levels of excessive inflammatory molecules that may be circulating around in your bloodstream. Let’s start by not making things worse. Allergies can be identified with the right blood tests or intra-dermal skin testing and then addressed with anti-histamines, progressive neutralization or avoidance. Diet can have a significant impact for or against inflammation. Once again, the usual suspects are implicated in promoting excessive levels of inflammation. Sugar is a potent pro-inflammatory molecule. Before the days of Insulin to treat diabetes, Aspirin , the grand-daddy of anti-inflammatory molecules, was used in high doses because it did indeed drop blood sugar levels. Unfortunately, the resulting ringing in the ears, headaches and dizziness limited its usefulness. Oxidized fats also stimulate the inflammatory response. Levels of oxidized LDL are a good marker for cardio-vascular risk. Molecules that are anti-inflammatory are usually also good anti-oxidants. Again, our usual friends can come to our rescue; vitamin C, carotenes, Curcumin, fish oil, certain enzymes, vitamin E and CoQ10 to name but a few. Lipoic acid can regenerate many oxidized molecules, re-activating their antioxidant properties. From a dietary perspective fruits and fresh vegetables are an important part of the solution. Fresh fruit is loaded with anti­oxidants. Recent research is focusing on dark colored berries, Blue Berries and Acai to name but two leading contenders for the title of “Top Berry”. An organic diet of moderation and fresh produce can be very helpful for most chronic illnesses. Left to its own devices, the body tends towards health. In most cases we have but to get out of the way. Jesse A. Stoff, MD, MDH, FAAFP is a licensed Medical Doctor, a Certified Naturopathic Physician, a Certified Acupuncturist, and a licensed Homeopathic Physician. He has authored/co-authored dozens of articles and 8 books including co-authoring the bestsellers Chronic Fatigue Syndrome: The Hidden Epidemic and The Prostate Miracle. He has also served as a member of the Clinical Nutrition Board of Cancer Treatment Centers of America, Inc. As Medical Director of the Stoff Institute for Medical Research, he consults with physicians and medical groups.